We will be kicking off the new year with a new way to schedule our technology resources.....Google Calendar. Scheduling of all technology resources - rooms, carts, etc. - will now be completed through your Google Calendar account. This process will be more streamlined. The January Staff Meetings will include a demonstration of the Google Calendar process. However, you can also watch the Calendar Resources video below for a demonstration of the scheduling process. Scribble Maps is a fun and easy way to create multimedia, interactive maps. It is a great tool for students to show their learning on a map! This tool is free (with ads on the side) and does not require a login. In Scribble Maps, students can add a variety of Place Markers, draw lines, add text, make a circle or box around an area, etc. These maps can then be shared with a link or embedded into a webpage or blog. How to create a multimedia map on Scribble Maps. I recently had the opportunity to hear Shawn McCusker present on the use of formative assessments to create a community of learners. Shawn is a Social Studies teacher and department chair at Libertyville High School in Libertyville, Illinois. During his presentation he noted that students who receive frequent formative feedback yield substantial learning gains. He went on to explain that formative assessment should no longer be seen as an event that occurs in the classroom, but that the classroom should have an environment of formative assessment that the teacher and the student play an active role in. 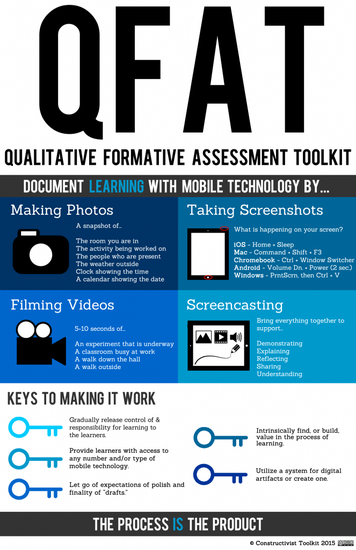 Technology can play a crucial role in creating a culture of formative assessment as it provides unlimited tools for gathering, sharing and storing student work and goals. The website below provides a few of the many tools available. Additionally, I will be adding a link to the Instructional Technology Website (found on the Lake George webpage or at (http://lgtechnology.weebly.com) that will have even more information about digital formative assessment tools...keep your eye out for it.